CardMonkey's Paper Jungle: Lovely Fancy Fold Card with Class! Remember the song, from The Sound of Music? 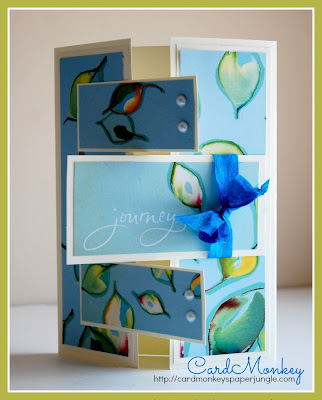 One of my favorite things is crafting with excellent paper such as that which I used on this "fancy fold" card that I've made using Kathy Davis's "Journeys" paper by GCD Studios. 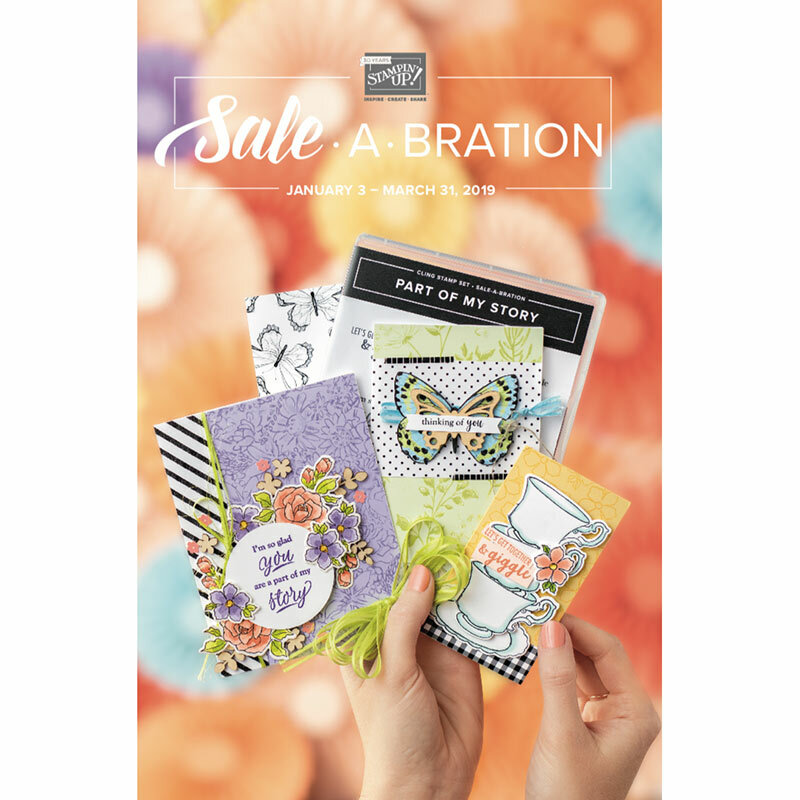 This paper is available at Joann Stores, both in-store and online (www.Joann.com). You can also find this beautiful paper at Kathy Davis Gallery (303 Horsham Road, Suite G, Horsham, PA), where you'll also find me this evening, teaching students to make this card along with four or five others. Truth be told, I love this paper so much, I just keep creating so up until I leave for class, that number might go up. Our classes are intentionally intimate. They're held in the Gallery (the retail space) itself, where many of us crafters derive tremendous inspiration. So our craft tables dislocate the retail displays temporarily and the shop is held open for up to 8 crafters at a time. Today's class (6-8:30 p.m.) is the third of the August Thursdays where I've taught. Now next Thursday, our last in the August series was to have been mini-albums. There was just one enrollee as of yesterday, and frankly, I don't know if it's the topic or the timing that has made it our least popular class. I've asked Bill (KDS's fantastic and enthusiastic VP!) to postpone it until after the upcoming Labor Day holiday. In the meantime, we'll be knocking heads (and his is hard -- and bald, LOL!) to come up with a schedule for my classes this autumn. And the FABULOUS news is that there will be other instructors brought in this autumn too ... It's especially fabulous for me, because I want to TAKE the classes, not just teach them!! The retail space is adjacent to the actual Gallery where Kathy Davis Studio artists display their immense talent for a month in personal shows. The new shows go up on the last Friday of every month. What talent! And many of these exhibitors (KDS staffers, all) will be the instructors! I encourage you to let me know if you'd like to be on an Art or Craft Class e-mail list at Kathy Davis Studios. I just can't wait to let you know what we're cooking up for the fall! Beautiful card!! 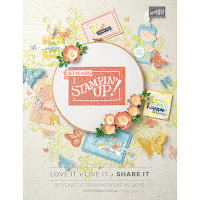 Love Kathy Davis products! Gorgeous card!! The fold makes the papers really pop!! The ribbon matches perfectly!!! Great job toots!! Great card. LOVE the blue and the KD papers. I see your postings on FB and I'm sooo happy for you. It would be super awesome to get to teach and craft!!!!! What fun!!! Sorry I've been a TERRIBLE blog commentor lately. I think I've got FBTunnel Syndrome, LOL....look at all the awesome things on FB and forget to hop over and give people <3 on their blogs. Wow - that is a fancy folded card! I will have to give it a try. Caddy blue is one of my favorite ribbons - seems to go with everything. Adore this card!!!! The papers are GORGEOUS (as is the Rumple Ribbon if I do say so myself ;) I'm overjoyed that you have a place to teach!! I so wish I was close enough to come as I'd be there in a heartbeat!!! Beautiful! Wow. this looks complicated, but the final product is fantastic. Ellen this card is Beautiful.. Can you teach me how to make it? What a stunning card this is! I love those papers, the fold, the rumple ribbon, well I love everything about it! The papers are gorgeous on this card! wow! Hi happy monkey. I came over from pinterest looking for "gems in an album" could u send a direct link to that post. Thanks so much. I Love this card!! The folds of this card are adorable. You also picked the perfect colors and papers.